I was diagnosed with ALL a couple weeks after my 28th birthday in February of 2010. I have been keeping a blog ever since detailing my treatment and life as a: young mom, wife, daughter, sister, friend, etc. Girl With The Swirl is a blog of a young gal going through the diagnosis of acute myeloid leukemia, chemotherapy treatment, side effects and life changing experiences. Combine this with a little humor and the realities of being a young cancer survivor, she tells it like it is. Our journey through our three-year-old son's battle with JMML and AML. This is our whole family's blog about our daughter and sister Delaney, who was recently diagnosed with leukemia. A blog about my journey since being diagnosed with AML (Leukemia) in July 2012, and my experiences with stem cell transplant. Thoughts, perceptions, experiences and anything else you may or may not want to know. My journal of how I am managing the diagnosis of leukemia and how everything affects me. I exist with chronic myelogenous leukemia (CML), Ehlers-Danlos Syndrome and a house-full of 7 teenagers. Not sure which is worse. Fighting cancer, one round at a time. My journey to be cured from AML. 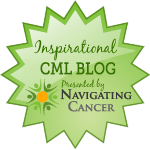 I created this blog to chronicle my experience battling AML from November 2012 to present day. 26 year old writing about AML as well as general musings, thoughts and anxieties about life with and after cancer. Diagnosed with a rare and aggressive form of leukemia (APL), this is my survival story. A devotional blog sharing our Christian faith journey fighting cancer. Our family member has Acute Lymphocytic Leukemia (ALL). Blogs, support groups, surveys and video interviews with Leukemia patients (CLL, CML, ALL, AML, etc.). This blog is about finding humor and meaning in the ups and downs of blood cancer treatment. Jennifer Bennett was treated for acute myeloid leukemia in 2015, and then she had the incredible luck of caring for her daughter when she was diagnosed with B-cell lymphoblastic lymphoma almost exactly one year later. the ramblings of an unexperienced teenager who's got a new change of perspective. Battling through Leukemia while continuing to breed optimism: Taking life as it comes, day by day. Blog about the journey of my 11-month-old boy from Canada, diagnosed in Sept. 2013. I share some of my mother's journal entries from when I was sick as well as my own experiences.